Nikonians are looking forward to the long-awaited replacement for the D80, and it looks pretty certain that the D90 will be the latest addition to the line of Nikon digital SLR cameras. The D90 might be announced during Nikon’s next planned press conference on August 27th, according to Thom. Check out his site, right now. And yes, there is a microphone grill on the front of the camera — it comes with video capture capabilities! 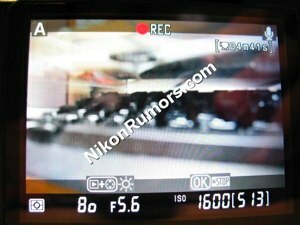 See the leaked photo below, which was first pointed out on NikonRumors.com. Thom Hogan says that this photo is legit. The photo also confirms what Thom earlier said about the D90 having GPS and geo-tagging capabilities — who knows, it might be able to geotag videos too. Thom won’t mention specifics about the video capture feature, since Nikon probably uses this information to pin down the source of the leaks. Here’s a more elaborate explanation on how leaks can be traced. Here’s a capture of the rear LCD of the D90 in video recording mode — is it legit? View the original, larger image at NikonRumors.com. Everybody’s curious to see the D90 photos Thom alluded to in his post, but he gives a reason why he can’t show them. A new Nikon 18-105mm f/3.5-5.6G DX AF-S VR Nikkor lens will also be introduced, and will have 67m filter threads. The price of the Nikon D90 is likely to be between $900 to $1000 USD. The price goes up to $1300 USD if bundled with the new Nikko 18-105mm lens. Thom has even mentioned (rather confidently) that Nikon D80 production has ceased, and the manufacture of the D90 cameras has begun (fifth reply). Jump right into the following threads to follow the discussion. Take special note of Thom Hogan’s posts. It won’t be a full-frame (FX) camera, but will have one surprise. The rear LCD will be 3-inch unit. A new Nikon DX lens will be introduced. A bit of trivia: Thom had a run-in with Nikon when he divulged the guess the D90 specs (12mp, 4.5FPS, 3” LCD, 11 point AF, D90, 105mm lens and HDMI) from Thom’s lottery numbers giveaway. Nobody’s sure if 105mm meant a zoom lens ending in the 105mm focal length, or a 105mm prime lens. There’s a hint here that Nikon might introduce 1080 video capture in the D90. I want one if they do. Just imagine, being able to capture video using SLR lenses — yummy.